Lok Sabha Elections 2019: Randeep Surjewala said it was the same Narendra Modi, who had in 2018 removed AFSPA from Meghalaya, 27 years after it was imposed in the north-eastern state. Congress's chief spokesperson Randeep Surjewala said while on one hand, the ruling Bharatiya Janata Party (BJP) was targeting the Congress over its manifesto promise of reviewing the Armed Forces (Special Powers) Act (AFSPA) in Jammu and Kashmir, on the other, the government itself was removing the law from certain states. "BJP leaders Amit Shah and Arun Jaitley are the biggest traitors as they themselves removed AFSPA from parts of Arunachal Pradesh only yesterday. What can be more double-speak than this," he told reporters after Mr Jaitley's criticism of the Congress for promising to review AFSPA in Jammu and Kashmir. Mr Surjewala said it was the same Narendra Modi, who had in 2018 removed AFSPA from Meghalaya, 27 years after it was imposed in the north-eastern state. He said another display of an "act of treason" by PM Modi and Mr Jaitley was the removal of AFSPA in 2015 from Tripura, 25 years after it was imposed in the north-eastern state by the Congress. "So a case of treason should be registered first against Prime Minister Narendra Modi, Amit Shah and Arun Jaitley for the display of their double-standards," Mr Surjewala added. He said the Congress had only stated that it would amend the AFSPA in accordance with Supreme Court directions and not repeal the Act, while the BJP was removing it from many states. "They are accusing us of being traitors, while they themselves are indulging in such activities," Mr Surjewala said. "Will Jaitleyji and others register a case of treason against themselves after tendering their resignation?," he asked. 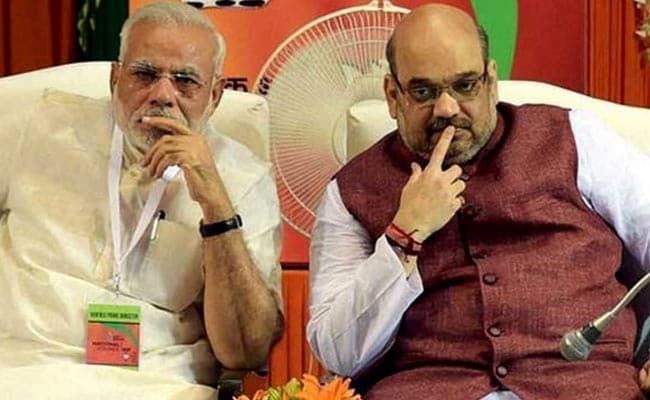 Keeping up the heat on the Congress over the issue of national security, the BJP has alleged that various provisions in the opposition party's manifesto for the upcoming Lok Sabha polls pose a threat to the country as those favour separatists and terrorists, and demoralise the armed forces. Defence Minister and BJP leader Nirmala Sitharaman alleged that the Congress's manifesto, which was released on Tuesday, was not in national interest and indirectly helped terrorists and others working against the country. She cited the opposition party's promise to review the AFSPA and repeal section 124A (sedition law) of the Indian Penal Code (IPC) to attack it. Ms Sitharaman insisted that her party was not against withdrawing the AFSPA if the situation allowed it, but the Congress's promise to tweak its provisions, if voted to power, would allow terrorists and their friends to target the security personnel with manufactured allegations.